Networks are visually more complicated than trees, because there are extra edges representing reticulate relationships. Technically this means that some of the nodes have in-degree >1, and that there are one-to-many connections among these nodes. This can create visual clutter. I recently presented one simple way that might alleviate this (Circular phylograms for phylogenetic networks). Another possibility is to add to the network what are called meta-nodes. These meta-nodes represent groups of nodes, so that the edges between the meta-nodes and the other nodes can represent different types of relationship. This reduces the one-to-many connections in the graph. As pointed out by Elijah Meeks at the Digital Humanities Specialist blog, pedigrees represent a neat example of this concept. In this example, there are several types of traditional relationship that can be represented: husband, wife and child. Since these relationships are explicitly shown (ie. the direction of the relationship is explicitly shown), the figure can be drawn unrooted. The example shown here (reproduced from Meeks' post) has the meta-nodes in grey, each representing a family. These nodes are unlabeled, while the person-nodes are labeled with the person's name and noble title. Females have pink nodes, and males blue ones. The edges connecting them to the grey nodes are colour-coded as: blue = husband, pink = wife, orange = child. 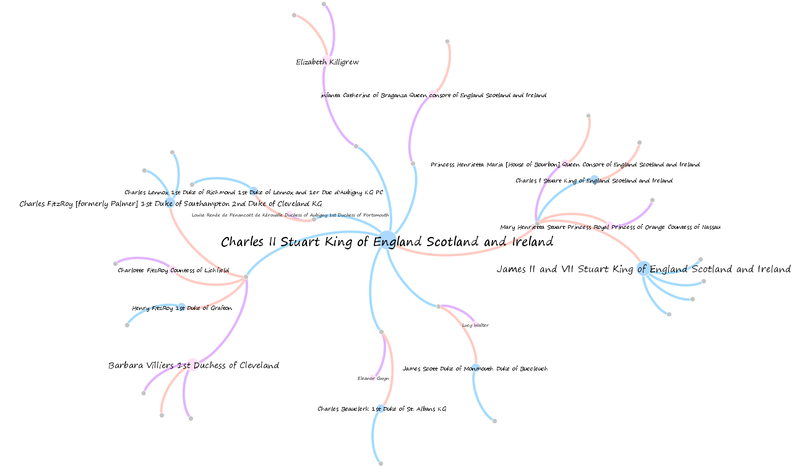 So, for example, the right-hand family node indicates that Charles I and Henrietta Maria were husband and wife, and that they had three children: Mary Henrietta, James II and Charles II. In this case, the reduction in one-to-many connections does make the relationships more clear, so that interpretation is easy. However, it potentially makes the network more complicated (as Meeks notes) because of "just how tangled up certain families can be" — adding the extra meta-nodes exacerbates the tangling. Meeks provides another example in his blog post.